Chaitén (Chile). During 16-30 September the lava dome complex continued to grow, producing gas plumes and generating block-and-ash flows from the collapse of unstable slopes. On 29 September observers in Chaitén town noticed an increase in the size of the eruption column. Webcam images showed a dark area in the plume, possibly from a collapse of part of the lava dome to the SW. An overflight revealed a third lava dome in the SW area of the complex, which filled a depression left by a collapse on 19 February, a NNW-trending depression along the centre of the dome complex with spines at the N end, and the disappearance of the central spine. Ash-and-gas plumes occasionally rising to 2 km above the domes came from two sources, the new dome and the central depression. The depression encircling the dome complex had been filled in by debris in several areas, and the depositional area at the mouth of the Blanco (or Chaitén) river had also grown. On 30 September and 3 October diffuse ash plumes, possibly mixed with steam and gas, rose to 2.4 km a.s.l. and drifted up to 55 km SE. Cleveland (Alaska, USA). There was a small explosive eruption on 2 October that produced a detached ash cloud at estimated altitudes of 4.6-6.1 km a.s.l. which drifted about 600 km NE. Galeras (Colombia). On 30 September there was an explosive eruption with reports of two explosions and the ejection of incandescent material. An ash plume rose to approximately 12.3 km a.s.l. and drifted E, then N. Sulphur dioxide emission rates were between 1,100 and 9,300 tonnes/day. Ashfall was reported up to 40 km NW. Following the eruption seismicity decreased and the sulphur dioxide emission rate fell to 300 tonnes/day. Gaua (Vanuatu). Seismicity increased during the previous two weeks, ashfall and sulphur odours were reported by local inhabitants and explosions were reported. Karymsky (Russia). During 25 September-2 October seismicity was elevated above background and possibly indicated weak ash explosions. A weak thermal anomaly was detected over the lava dome on 28 September, and scientists saw fumarolic activity during an overflight on 1 October. Kliuchevskoi (Russia). During 25 September-2 October seismicity was slightly above background levels and weak tremor was detected. Satellite imagery revealed a weak thermal anomaly over the volcano. Strombolian activity ejected tephra 70-100 m above the crater during 28-30 September. Sakura-jima (Japan). During 30 September-6 October explosions produced plumes to 1.8-4.3 km a.s.l. Plumes occasionally drifted E, N, and W. Explosions from Showa crater on 2 October ejected incandescent tephra 800 m away from the rim, and on 3 October, Minami-dake crater exploded violently, producing an ash plume that rose 3 km above the crater and ejecting ballistics 1.7 km away. Shiveluch (Russia). During 25 September-2 October seismicity was above background levels. A large daily thermal anomaly was detected over the lava dome, and fumarolic activity was occasionally seen. Seismic data indicated that ash plumes possibly rose to 7 km a.s.l. on 27 September and to 4.5 km on other days. According to video camera data and visual observations, ash plumes rose to an altitude of 4 km a.s.l. on 28 September. An ash plume was seen on satellite imagery drifting 65 km ESE on 29 September. Soufrière Hills (Montserrat). On 4 October at 21:00 a short volcano-tectonic earthquake swarm was detected, and a period of tremor and vigorous ash venting followed about an hour later producing an ash plume that drifted WNW and caused ashfall in Old Towne and Olveston. Two rockfalls followed the ash-venting event, but no explosive activity or pyroclastic flows were detected. During midnight to 0600 on 5 October, intermittent ash venting produced ash plumes that drifted WNW, and two further ash venting episodes occurred at 1035 and 1325 with no precursory seismicity, producing ash plumes to 3-4.6km a.s.l. and ashfall S of inhabited areas. On 6 October several ash clouds rose to altitudes of 3.7-5.5 km a.s.l. and drifted W.
Batu Tara (Indonesia). During 30 September-3 October and 5-6 October ash plumes rose to 2.4 km a.s.l. and drifted 25-75 km W, NW, and N.
Dukono (Indonesia). On 2 October an ash plume rose to 2.7 km a.s.l. and drifted 75 km NE, and on 6 October an ash plume rose to 3 km a.s.l. and drifted 55 km NE. Kilauea (Hawaii, USA). During 30 September-6 October lava continued to flow SE from through a lava tube system to the Waikupanaha ocean entry. Thermal anomalies revealed active surface lava flows. The Halema’uma’u crater vent continued to produce a diffuse white plume that drifted SW. During 30 September and 2, 4, and 5 October a lava pond within the vent, about 200 m below the crater floor, rose and fell, circulated, and weakly spattered. Preliminary measurements indicated that sulphur dioxide emission rates at the summit remained elevated; 410 tonnes/day on 30 September, 650 tonnes/day on 1 October and 480 tonnes/day on 2 October (2003-2007 average rate = 140 tonnes/day). Langila (Papua New Guinea). On 30 September an ash plume drifted 260 km NW at 4.3 km a.s.l., and on 5 October a diffuse ash plume rose to 3 km a.s.l. and drifted 185 km N.
Popocatépetl (Mexico). During 3-6 October emissions of steam and gas from contained slight amounts of ash. Rabaul (Papua New Guinea). During 25 September-1 October grey ash plumes from Tavurvur cone rose 2 km above the crater and ashfall was reported in Rabaul town (3-5 km NW) and surrounding areas. Incandescence from the summit crater was occasionally seen at night and incandescent lava fragments were ejected from the crater. On 6 October an ash plume rose to 3 km a.s.l. and drifted 55 km NW. Reventador (Ecuador). On 4 October an ash plume drifted W. Ash was not seen in satellite imagery but an occasional thermal anomaly was detected. Sangay (Ecuador). on 4 October a pilot reported an ash plume drifting W at altitudes of 5.2-7.6 km a.s.l. Suwanose-jima (Japan). Explosions were reported on 1 October, and a plume rose to 1.5 km a.s.l. 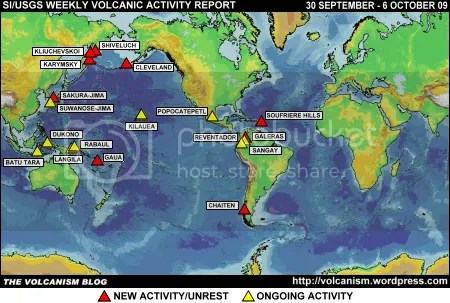 and drifted W.
The foregoing is a summary of the Smithsonian Institution/United States Geological Survey Weekly Volcanic Activity Report covering 30 September to 6 October 2009. It is provided for information only, and is based on but not a substitute for the full report, which comes with its own criteria and disclaimers. The map base is derived from the Smithsonian Institution/USGS/US Naval Research Laboratory This Dynamic Planet website.